Here are the answers to some of the most commonly asked questions. Q: Do your liners have fragrance or emit an odor? A: No, our liners do not off-gas or have any fragrances or odors. Q. Can a homeowner buy their own liner and install it themselves? Q: Can I encapsulate my crawlspace myself? A: Yes, Many homeowners do encapsulate their own crawlspace. Q: Will Encapsulating my crawlspace improve my living conditions? Lowers heating and cooling bills. Increases the re-sale of your home. Q: Can Global Plastic Sheeting refer me over to a Crawlspace Contractor? Q: How do I know how good my liner is at blocking out water vapor? A: The Best Way is to find out what the Perm Rating is on the liner. A perm rating is a measure of the diffusion of water vapor through a material. In a Crawlspace the liner should have a Perm Rating of 0.07 U.S. Perms or lower. Also make sure the Perm Rating was test to ASTM E96 Standards. Q: What color should my liner be? A: The Industry Standard is white. This is because most crawlspace are very dark with little to no lighting. White is used because it is reflective and gives the Crawlspace a clean look. Q: Does the liner need to be reinforced? A: Although must crawlspace vapor barriers are string reinforced the liner does not have be. Just make sure to check Vapor Barriers product data sheet and make sure it the tensile strength and puncture test are listed. Q: Does a Crawlspace Vapor Barrier need to be Anti-Microbial? A: No, if the vapor barrier is made from Virgin Resin material then an Anti-Microbial additive is not needed. 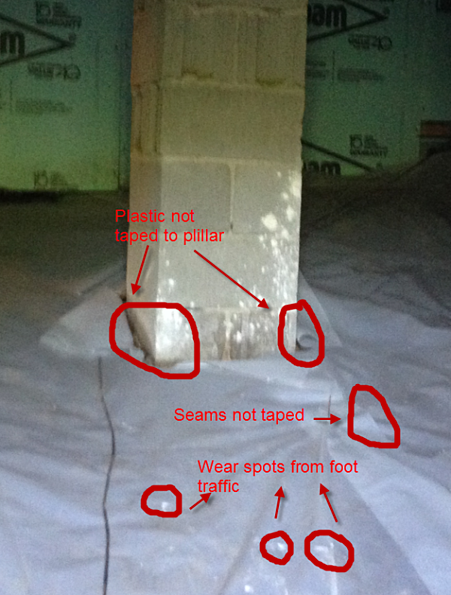 Virgin Resin/Engineered Vapor Barriers do not promote mold growth. Mold cannot grow on these materials those eliminating the spread of mold as well. Q: What tools and accessories do I need to encapsulate my Crawlspace? Q: Do you sell to Home Owners? Q: Are there Flame Retardant Crawlspace Vapor Barriers? A: Yes there are Flame Retardant Vapor Barriers. Always ask for samples of this material and do your own test. There are lots of companies advertising Flame Retardant Crawlspace Vapor Barriers that are not Flame Retardant. Flame Retardant does not mean Fire Proof. It means that if you were to light the plastic on fire it would self extinguish itself. Q: How do I adhere the plastic to the foundation walls? A: To adhere the plastic to the foundation walls you should use a Double Sided Butyl Tape commonly called Foundation Tape. Then anchor them in using ¼” foundation pins. Q: How do I install the foundation pins? A: After the plastic is taped to the foundation Walls, drill preset holes through the plastics and butyl tape into the foundation walls. After that you can insert the foundation pins into the holes. Q: Will drilling holes into the liner affect the performance of the product? A: No, because the Butyl Tape is self-healing once the pins are in place the Butyl Tape will seal around foundation pins and line,r ensuring the encapsulation is intact. Q: How far apart should I place the foundation pins? Q: How much do I need to overlap the plastic before seaming them together?